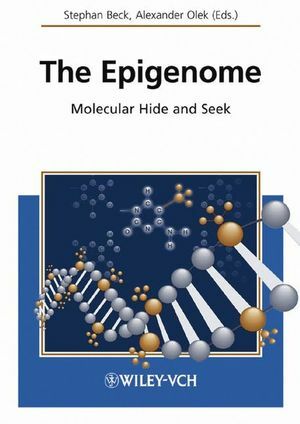 This is the first book that describes the role of the Epigenome (cytosine methylation) in the interplay between nature and nurture. It focuses and stimulates interest in what will be one of the most exciting areas of post-sequencing genome science: the relationship between genetics and the environment. Written by the most reputable authors in the field, this book is essential reading for researchers interested in the science arising from the human genome sequence and its implications on health care, industry and society. Stephan Beck is the editor of The Epigenome: Molecular Hide and Seek, published by Wiley. Alexander Olek is the editor of The Epigenome: Molecular Hide and Seek, published by Wiley. 1 Five Not Four: History and Significance of the Fifth Base (Douglas S Millar, Robin Holliday, and Geoffrey W Grigg). 1.2 Sequencing 5-methylcytosine (5-mC) Residues in Genomic DNA. 1.5 Abnormal DNA Methylation in Cancer Cells. 2 (Epi)genetic Signals: Towards a Human Genome Sequence of All Five Nucleotides (Walter Doerfler). 2.2 Towards the Complete Sequence of the Human Genome with Five Nucleotides. 2.3 Patterns of DNA Methylation – the Scaffold for Building a Functional Genome. 2.4 DNA Methylation Patterns in Segments of the Human Genome and in Viral Genomes. 2.4.1 On Viral Genomes and Foreign DNA Integrates. 2.5 Ins ertions of Foreign DNA into Established Mammalian Genomes. 2.6 De Novo Methylation of Integrated Foreign DNA. 2.6.1 Ad12 Genomes in Hamster Tumor Cells. 2.6.2 De Novo Methylation of Foreign DNA Integrated into the Mouse Genome by Homologous or Heterologous Recombination . 2.7 Genome-wide Perturbations in the Mammalian Genome upon Foreign DNA Insertion. 3 Epi Meets Genomics: Technologies for Finding and Reading the 5th Base (Tim Hui-Ming Huang, Christoph Plass, Gangning Liang, and Peter W. Laird). 3.1 The Development of 5th-Base Technologies. 3.1.2 A Unique Chemical Reaction that Modifies Methylated DNA. 3.1.3 The Advance of 5th Base Technologies in Epigenomic Research. 3.2 Restriction Landmark Genomic Scanning (RLGS): Finding the 5th-base Signposts in the Genomic Atlas. 3.2.2 How Does RLGS Work? 3.3 Methylation-sensitive Arbitrarily Primed (AP) PCR: Fishing for the 5th Bases in Genomic Ponds. 3.3.2 How Does MS AP-PCR Work? 3.4 Differential Methylation Hybridization (DMH): Identifying the 5th Bases in the Genomic Crossword Puzzle. 3.4.2 How Does DMH Work? 3.5 MethyLight: Finding 5th-base Patterns in Genomic Shadows. 3.5.2 How Does MethyLight Work? 4 Mammalian Epigenomics: Reprogramming the Genome for Development and Therapy (Wolf Reik and Wendy Dean). 4.6 Epimutations and Epigenetic Inheritance. 5 At the Controls: Genomic Imprinting and the Epigenetic Regulation of Gene Expression (Anne Ferguson-Smith). 5.2.1 The Role of DNA Methylation in Imprinted Gene Expression. 5.2.3 Organization of Imprinted Genes. 5.2.4 The Mechanism of Imprinting at the Mouse Igf2r Imprinted Domain Requires a Cis-acting Noncoding Antisense Transcript Regulated by DNA Methylation (Fig. 5.2a). 5.2.5 Imprinting at the Mouse Distal Chromosome 7 Domain Is Regulated by at Least Two Imprinting Control Regions (ICRs) Acting on Different Sets of Genes (Fig. 5.2b & c). 5.2.6 The Mechanisms of Imprinting at the PWS/AS Imprinted Domain (Fig. 5.2d). 5.3 DNA Methylation and Chromatin. 6 Epigenetic Trouble: Human Diseases Caused by Epimutations (Jörn Walter and Martina Paulsen). 6.2 Mechanisms of DNA Methylation. 6.3 Molecular Recognition of Methylation Patterns. 7 Liver or Broccoli? Food’s Lasting Effect on Genome Methylation (Michael Fenech). 7.2 Important Dietary Sources of Folate, Vitamin B12, Choline, and Methionine. 7.3 Evidence from in Vitro Cultures for the Role of Folic Acid in Genomic Stability of Human Cells. 7.4 Evidence from in Vivo Studies for the Role of Folate and Vitamin B12 in Genomic Stability of Human Cells. 7.5 Environmental and Genetic Factors that Determine the Bioavailability of Folate and Vitamin B12. 7.6 Recommended Dietary Allowances (RDAs) for Folate and Vitamin B12 Based on Genomic Stability. 8 Living Longer: The Aging Epigenome (Jean-Pierre Issa). 8.2 Methylation as a Mark of Epigenetic Silencing. 8.3 The Dogma: Formation of Methylation Patterns. 8.4 The Reality: Age-related Methylation and Epigenetic Mosaicism in Normal Epithelium. 8.5 The Consequences: Methylation and Age-related Diseases. 8.6 The Bottom Line: Clinical Implications. 9 Digitizing Molecular Diagnostics: Current and Future Applications of Epigenome Technology (Sven Olek, Sabine Maier, Klaus Olek, and Alexander Olek). 9.2.1 Advantages of Methylation as a Diagnostic Parameter. 9.2.3 Methylation, the Environment, and Lifestyle Diseases. 9.3.1 The Development of Tissue Engineering. 9.3.3 ...That May Be Met by DNA-methylation Technologies.